The Thai prime minister's new pop song has not been a hit with the public. 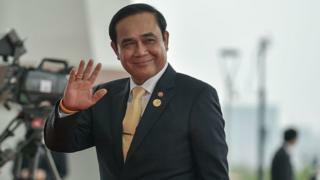 PM Prayuth Chan-ocha released the jaunty number on YouTube, where it has gathered more than 25,000 thumbs downs, compared with 1,000 positive reactions. Some thought Diamond Heart was a Valentine's gift to the nation. But a spokesman for the military-backed government played down the association, AFP reports. Mr Prayuth led a military coup in 2014; elections have repeatedly been delayed. His critics say they want new elections, rather than new music. The lyrics to Diamond Heart were written by Mr Prayuth and it is sung by a loyal Thai army officer. The sentimental lyrics talk of promising to overcome obstacles with a woman, who is seemingly supposed to represent the Thai nation. We have to build our hearts' dream together so it's resilient". On social media, many made political plays on the song's title. "People with true diamond hearts would not lie day after day... and seize power from women," one Twitter user wrote, referencing to Thailand's elected leader, Yingluck Shinawatra, who was ousted in the coup. Mr Prayuth had promised elections would be held in November, following numerous delays. However, a new election law passed by parliament in January could see them delayed until 2019. Thailand's military has a history of intervening in politics and has seized power 12 times since the end of the absolute monarchy in 1932. A previous song released by PM Prayuth, called "Returning Happiness to the People", was designed to encourage better relations between the military and the people after the last coup.